Every soccer player dreams of international success, and it’s no different when it comes to referees. And that is exactly what Katja Koroleva has set her sights on after successfully refereeing the NWSL Championship Game. Assisted by Amanda Ross and Jennifer Garner, Koroleva oversaw FC Kansas City’s 1-0 win over the Seattle Reign at Providence Park in Portland, Ore, on October 1. Now the FIFA referee has looked ahead to further honors on the international stage. How did you feel in the build up to the NWSL Final? This has been an incredible year for soccer, as the build up from the World Cup has had an immediate impact on soccer worldwide, including the NWSL. We all felt the increased interest and excitement for domestic and international matches, which was evident in the record level of support for the rivalry NWSL Final matchup between Seattle and Kanas City. It sets a great platform, that we are all excited to build off of to further elevate the game. How did the NWSL Final go from an officiating point of view? Our crew of referees, through preparation, focus, concentration and teamwork, allowed the players to have a safe and competitive environment to determine the winner of the Final. Where does the NWSL Final assignment rank in your career? It’s always an honor to be considered to referee a Final of any caliber. During a lifetime as a referee these stand out on a separate list as very special memories. What’s next for you – do you have any targets? As a FIFA referee, domestic success is always welcomed and certainly helps build on the necessary skills and knowledge of the game for international success. World Cup 2019 in France has been circled on my calendar, and is the ultimate goal over the next four years. 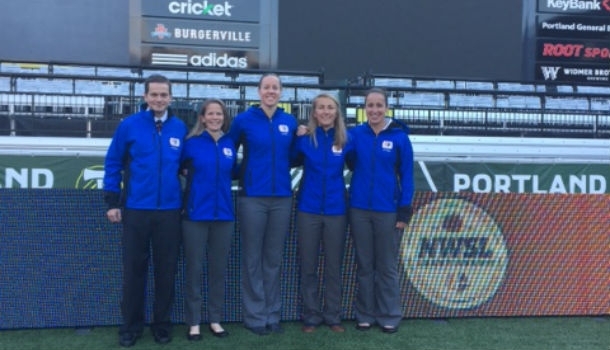 The domestic season in leagues such as the NWSL, USL, and Open Cup are all factors of building a referee portfolio with tools to be successful on a platform such as the World Cup. What about short-term aims; what’s your plan for the next few months? Although the NWSL season is over for this calendar year, other U.S. Soccer/PRO assignments and international competitions still remain. Our focus is always on continually improving the quality and expectations of World Class officials. One way that we specifically do that is by evaluating previous matches, identifying areas of importance, and adjusting our approach to pursue excellence. This includes both on and off the field training, analysis, and evaluation so that we are prepared to serve the game.